This isn’t a weekly feature anymore, obviously, but that doesn’t matter! Being Canadian and experiencing the Northern Lights on a number of occasions, I will never get tired of seeing them. Blizzard did a great job of making them in-game in Northrend, especially in Howling Fjord. This view looks toward Utgarde Keep, just over a Vrykul settlement. A moment of peace in an otherwise war-torn zone. Here we are, 4 and 2.5 years after the content was released, and I’m doing a review of the Outland and Northrend areas of World of Warcraft. Timely reporting, right? In this case, it actually is – I just finished getting my former-lowbie priest up to level 80 and blazed a trail through the two former content areas. As I adventures through these places, I was reminded of things that I liked and things I certainly didn’t like. With heirlooms, I actually didn’t go through all of the zones for each continent. (As an aside, I was using the heirloom shoulders, chest, cloak, weapon, and trinket.) Even without, I know that I could have skipped some areas. It is nice that the leveling process has been eased as time goes by through these old areas, as what was once the best part of the game is now some of the worst. Outland and Northrend are now suffering the “middle child” disease, being forgotten and overlooked. Cataclysm brought us a completely redesigned Kalimdor and Eastern Kingdoms (less a few zones, coincidentally from Burning Crusade), and going from levels 1-60 in the “old” world is now very exciting and fun. Prior to Cataclysm, people would power their way through the Vanilla content so they could get to the better things in Outland and beyond. Now the two continents are relics of an old design philosophy. Cataclysm has brought so many new quest mechanics and storylines that it’s truly fun to play through the zones and see what all is going on. Outland and Northrend have many of the same thing over and over again with little deviation. My progression through Outland started with Hellfire Peninsula, going through half of Zangarmarsh, and then finishing most of Nagrand before hitting level 68. With 25% experience bonus from heirlooms and an extra 10% from the guild perk, the levels flew by – so much that I was level 73 before hitting Zangarmarsh. I only did two instances, and that was my wife running me through Hellfire Ramparts and the Blood Furnace. This time I was going for efficiency in leveling, and wanting to get through as fast as I could. One relic quest design that still exists in Outland is the amount of Elite/Group quests. Fortunately, as I was playing a Shadow Priest this time around it was actually fairly easy and I was able to solo a majority of them. There were the few that I needed help with, like Arazzius the Cruel and Durn the Hungerer, but more often than not I was fine. Nagrand is my favourite zone from Burning Crusade. The looks of it were just amazing, along with very good questing design for the most part. However, this zone suffers from quest hub-itis. There are five places in the zone where you get quests (mostly), and three of them are in the same area – for the Horde side at least. This means that while you can grab about 7-12 quests at once, there’s a lot of travel time involved from place to place. As much as down time is necessary to regroup and calm down, there’s a lot of travel time involved in Nagrand. All in all, Outland isn’t a bad place – it’s just boring to me. I’ve gone through Outland numerous times and it’s still the exact same as it was when it first came out, with the exception of how long it takes to get through it. There are many great views, quests, NPCs, and other things to see along the way. I just ask that Blizzard update things to make them better. If someone has never gone through the continent before, I think they would enjoy it. Going through Northrend was also a lot quicker than at first, mainly due to heirlooms and guild perk. I started in Howling Fjord, did all of Dragonblight and Zul’Drak, then about halfway through Storm Peaks is where I ended up hitting level 80. Through this I only did two instances, both through the LFD tool, coming up with Utgarde Keep and Halls of Stone (of course). Normally in my quest to level alts, I end up getting stuck around the beginning of Northrend. I can usually make it through the first zone, usually Borean Tundra, but by the time I reach Dragonblight I get bored very quickly. 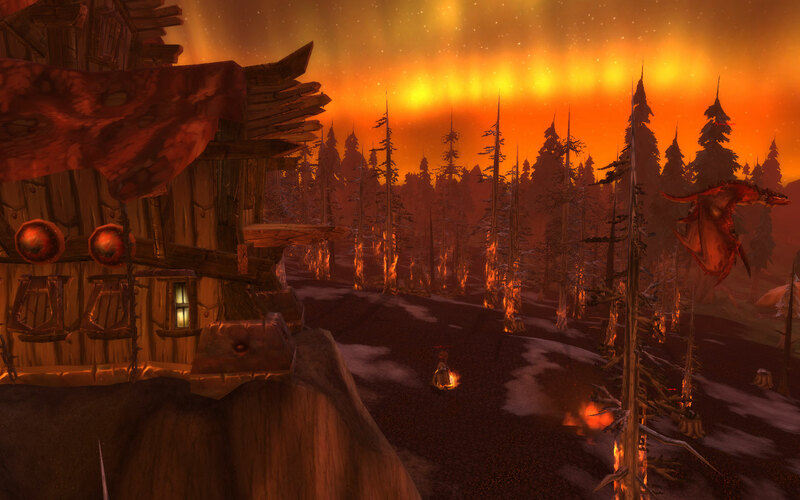 In a WoW Insider Show, they had likened the province of Manitoba as being the Dragonblight of Canada, and I have to agree – Dragonblight is just boring. As I said, I normally start from Borean Tundra so the first area I hit in Dragonblight is Agmar’s Hammer. Since I started in Howling Fjord this time I did the Venomspite quests first, which is what I believe made the difference. It wasn’t much of a change, but any change is welcome in boring content. Similar to Outland, there were a number of Elite/Group quests that were out there. Also similarly, I was able to solo most of them and only needing help with the ones that had mechanics that were harmful to cloth-wearers. The travel time to get to different places still was a big factor, but not nearly as bad as Outland. By this time, Blizzard seems to have learned that people don’t like having to fly somewhere for five minutes before getting to the quest objective. During my initial time in Wrath, I didn’t really have a favourite zone. This time, Zul’Drak really stood out to me – the story of an empire that wanted to fend off the Scourge so badly that they killed their own gods out of desperation. I would love to see the zone the way it was before, as the pinnacle of a troll empire. Right now Northrend is still too fresh in my mind from Wrath. Cataclysm has only been out for five months, so it hasn’t been long enough for me to get over it. The zone and quest design isn’t bad, but I’m glad it’s not the current one anymore. Many times through my leveling experience, I was extremely thankful for the ability to have a flying mount. Originally, flying wasn’t available in Outland until level 70 and in Northrend until level 77. Having to run through all the stuff before was painful enough, I am so very glad that I didn’t have to do it again. Last year I wrote up some retrospectives about Vanilla, Burning Crusade, and Wrath of the Lich King. Going through the two expansion contents, I’m reminded about many of my original observations and my overall conclusion from them: I’m glad that I was able to play through them when they were relevant, but I’m very glad that it’s the past. What’s done is done, and I’m glad the game is moving forward. It shows how much Blizzard has done to improve the game over time. Anyone who says that the game was better during Vanilla, Burning Crusade, or Wrath is a liar. The game as it is today is far more superior to the previous content. Blizzard will always improve their work. I’m very glad to be back in Cataclysm content. Hyjal, here I come! This week’s screenshot comes from Howling Fjord, taken while leveling my new Shadow Priest the other night. 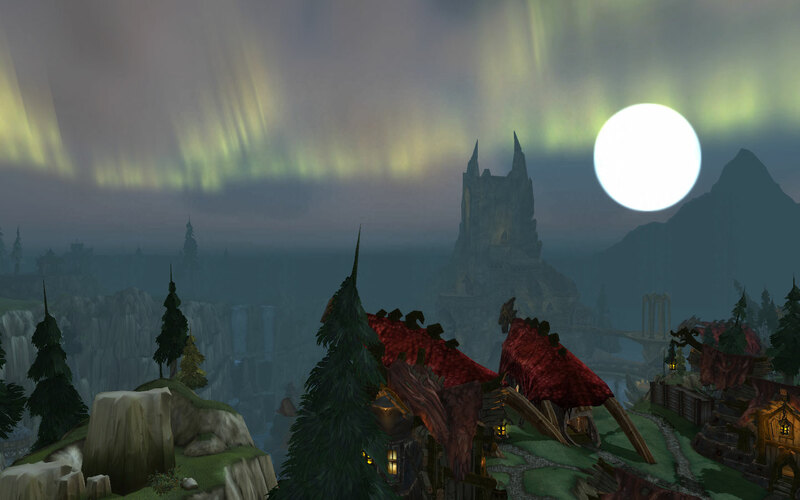 I really like this picture as it shows the beauty of the skies of Northrend alongside the destruction that is around the zone. It doesn’t help that the Royal Apothecary Society is plaguing the proto-drakes in the area either.